Student Aimee Ketchum won first place at a recent social enterprise pitch challenge for STEM Starts Now. Science, technology, engineering and math (STEM) learning starts at birth, said Aimee Ketchum ’18, a doctorate of occupational therapy student at Jefferson (Philadelphia University + Thomas Jefferson University). Ketchum developed the STEM Starts Now digital parenting platform to address this need. It includes language, motor, cognitive, social/emotional and early STEM learning tips and supports and empowers parents and caregivers. 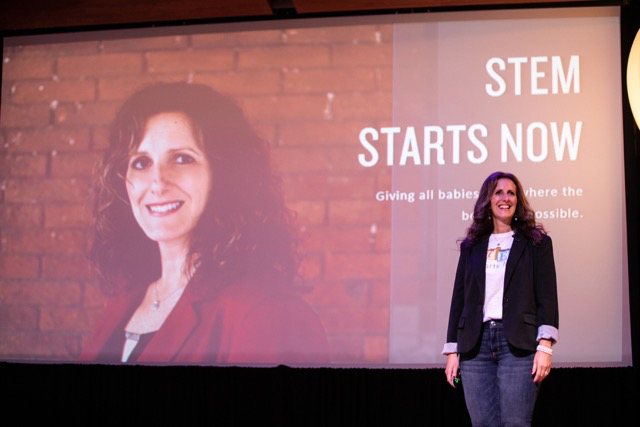 At a recent social enterprise challenge at Millersville University, Ketchum pitched her resource and won the top prize of $7,500 and an additional $15,000 in pro bono business services. Jefferson has played an instrumental part in STEM Starts Now’s success, said Ketchum, owner of Aimee’s Babies Child Development Company. In particular, the coursework helped her with the research and IRB process, as well as writing and delivering presentations. “OTs have a huge role in early STEM because it’s really just about teaching parents to encourage babies’ natural sense of curiosity and wonder and provide sensory experiences to support that early learning,” said Ketchum, who uses STEM as early as the NICU where she works at UPMC Pinnacle in Lititz, Pa. STEM Starts Now builds on Ketchum’s Word Gap App, an app that creates awareness and educates parents on the importance of interacting with their young children. It has received $35,000 in funding from the Department of Health and Human Services.